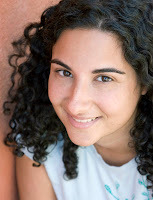 About Gina: Gina Damico grew up under four feet of snow in Syracuse, New York. She received a degree in theater and sociology from Boston College, where she was active with the Committee for Creative Enactments, a murder mystery improv comedy troupe that may or may not have sparked an interest in wildly improbable bloodshed. She has since worked as a tour guide, transcriptionist, theater house manager, scenic artist, movie extra, office troll, retail monkey, yarn hawker and breadmonger. Croak is her first novel. She lives in Boston with her husband, two cats, and a closet full of black hoodies. About CROAK: Sixteen-year-old Lex Bartleby has sucker-punched her last classmate. Fed up with her punkish, wild behavior, her parents ship her off to upstate New York to live with her Uncle Mort for the summer, hoping that a few months of dirty farm work will whip her back into shape. But Uncle Mort’s true occupation is much dirtier than that of shoveling manure. Pre-order CROAK: Amazon, Barnes and Noble, or Indiebound! About the Hunt: On this hunt you will be able to gain access to exclusive bonus material, sign up for giveaways, and get an all access pass to top secret insider information. This fabulous sneak peek into what’s coming up in YA literature is for three days only! About the Grand Prize: As an extra bonus we’ve put together a puzzle with one keyword found on each website. Complete it and you will be eligible for a fantastic GRAND PRIZE which will include signed editions of books, signed bookmarks, jewelry, and many more exclusive gifts with at least one gift from EVERY AUTHOR! Rules: To be eligible for the grand prize, you must submit the filled in puzzle before noon on Dec 4th Pacific Time. All the keywords must be in the correct place and you must include your full name and address. Entries sent in without name and address will not be considered! Ready to go to the next website on the Scavenger Hunt? Hey, I don't see any words in red or special bolded ones... Am I missing something? The only red word is Croak and that's not on the list. A "murder mystery improv comedy troupe", eh? Wow, that sounds incredibly original and awesome! 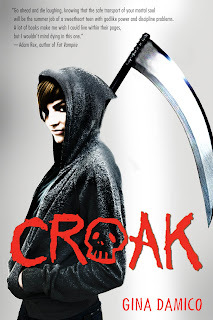 Just added Croak to my to read list- it sounds fabulous!! Croak sounds like a really good book. I will be looking forward to it. the link above for the special info needs a password. it keeps asking me for one. did I miss something? thanks for the help. I wanted to read Croak before, but I want to read it even more now. That excerpt is so enticing. Thanks for sharing! Me too. Is the word hidden somewhere? I better use my Sherlock Holmes glasses then. :)Thanks for the wonderful hunt.